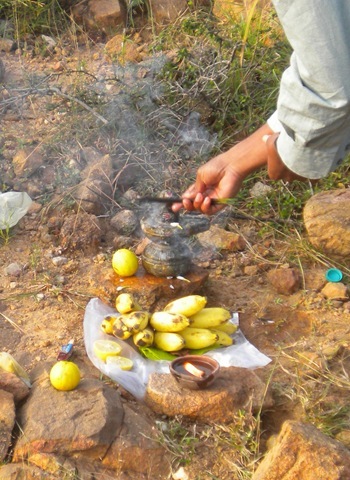 Opening the Arunachala "Inner Inner Path"
In many places, Arunachala’s Inner Path goes some distance away from the mountain. Months ago, my wife, Carol, had the idea, “There must be a path closer to Arunachala.” We examined the satellite photos on Google Maps, talked to people, and went out and looked to see what we could find. It turns out that there are many paths (though many of these are really cow paths). 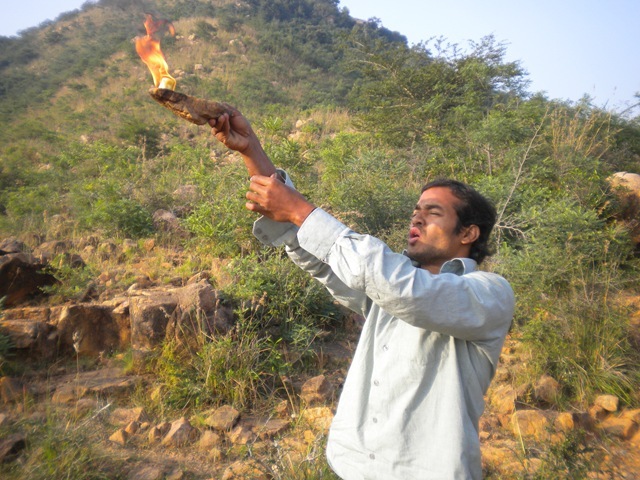 So we explored and gradually came up with a route for the first section of what we call the ‘Inner Inner Path.’ Over the last few weeks, some Indian men (mainly Saran and his friend, Mani) have been working to improve the primitive path whose route we found. 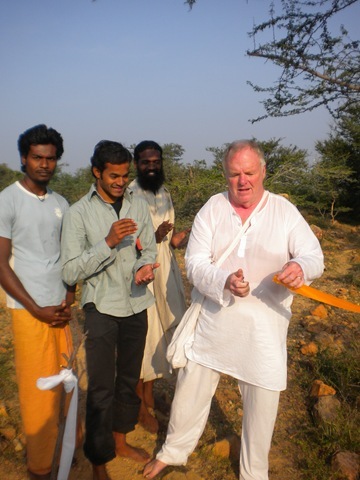 Now the work is done, and today we ‘officially’ opened the Inner Inner Path. This posting shows the opening ceremony. In this post, I want it to be as if you were with us today for the puja, so I show it in some detail. The next post will show the first walk along the newly opened path. 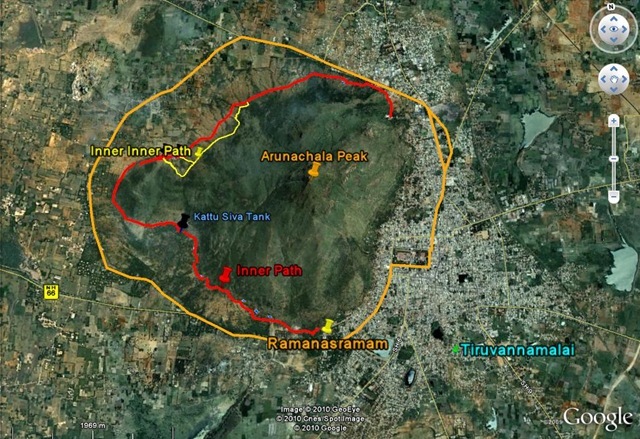 Here is a map, made using Google Earth, that shows Arunachala, with the Outer Path (in gold), the Inner Path (in red), and the new Inner Inner Path (and other mountain paths, in yellow). 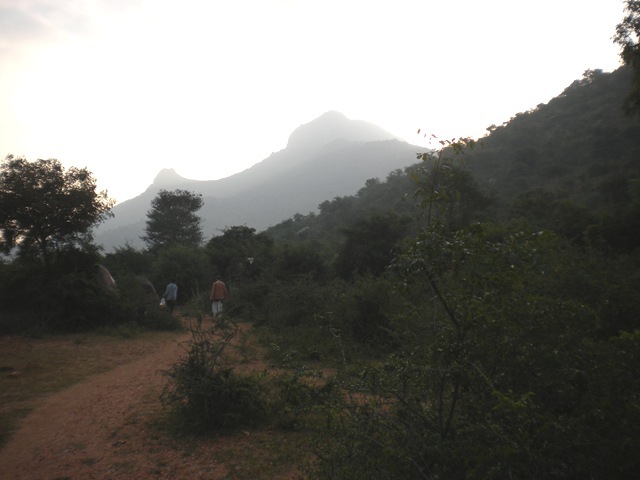 The Inner Inner Path starts on the north side of Arunachala. The first 2 km starts after you pass Parvati Hill. 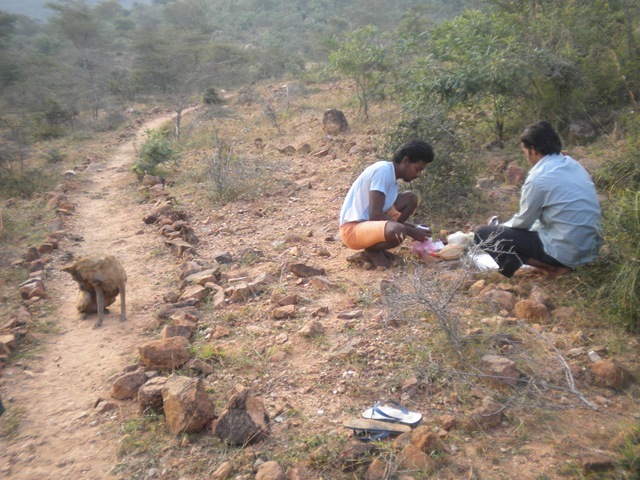 The path then goes along the base of Arunachala, then comes out back onto the Inner Path. It was a bit before 7 Am when I left my house. 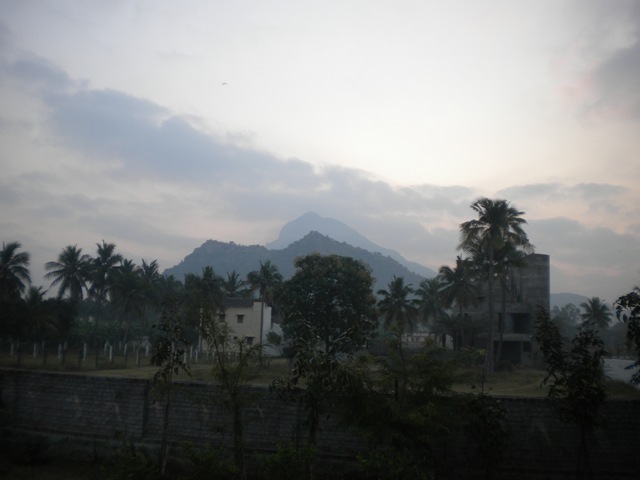 The day started with clouds over Arunachala. 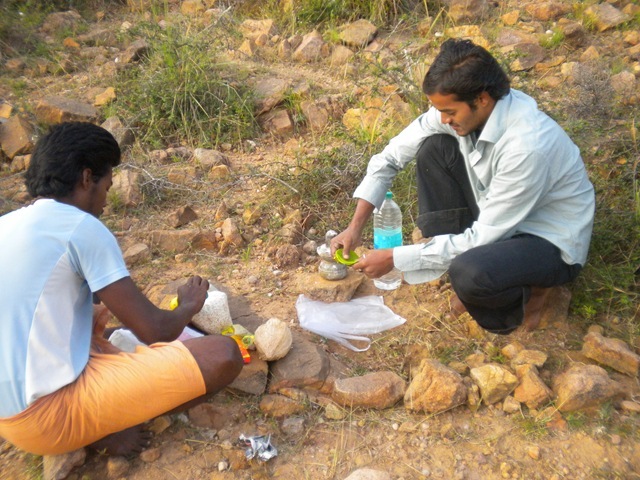 I met Saran and Mani at the chai stand by Girivalam Road, at the entrance to the path to Kannapa Temple. Three other men, two Westerners and one Indian man, were also joining us for the opening ceremonies today. And Tigger came with us. We started walking to the new path. We are getting closer. You can see the Arunachala peak in the background. Now we are at the new path. Someone has laid rocks across the old Inner Path route. Mani is removing these rocks. Mani and Saran start to set out the puja. 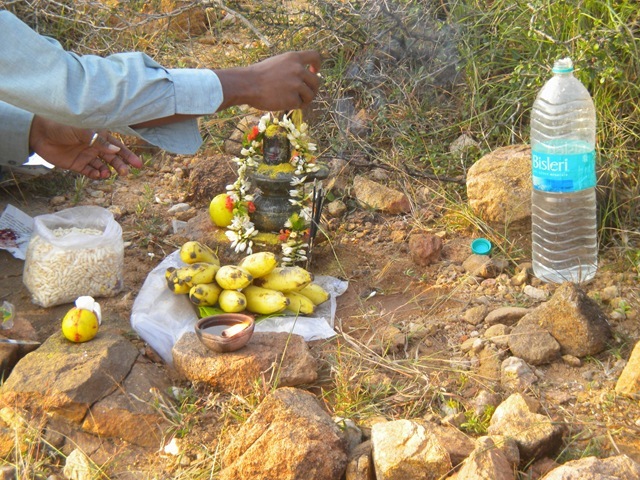 A lingam has been placed nearby. We borrowed it for the puja. 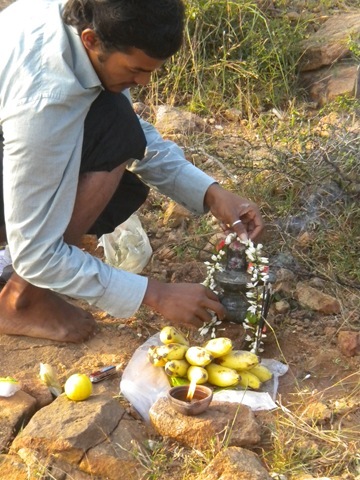 Saran is placing betel leaves and betel nuts (pan) in front of the lingam. 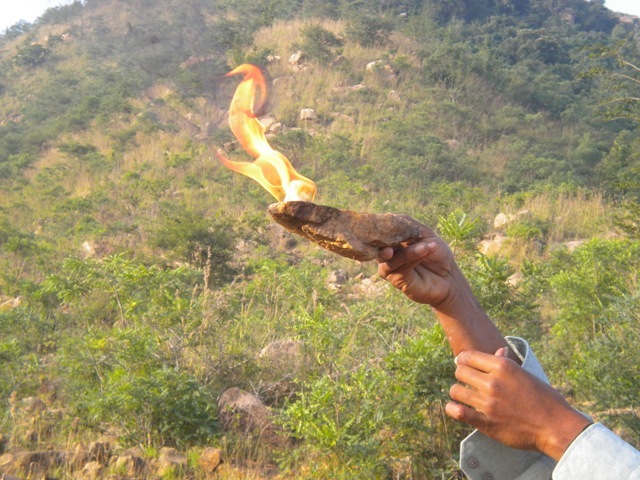 A ghee lamp is set out and lit. 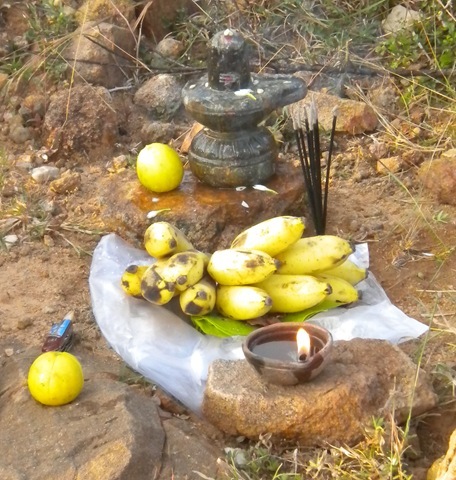 Lemons are cut, sliced in quarters, and placed by the lingam. 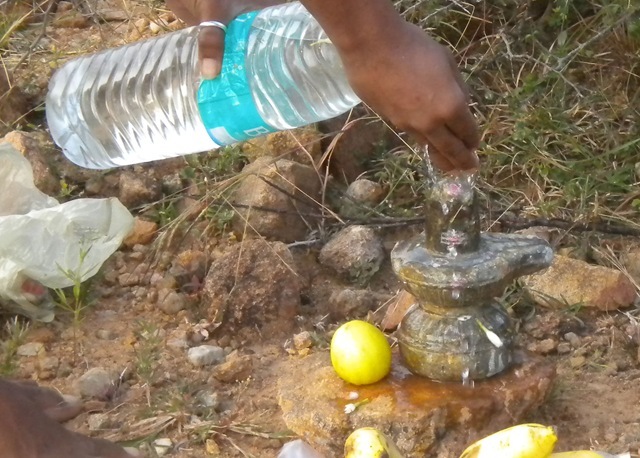 Water is poured over the lingam, the first of the ritual baths. 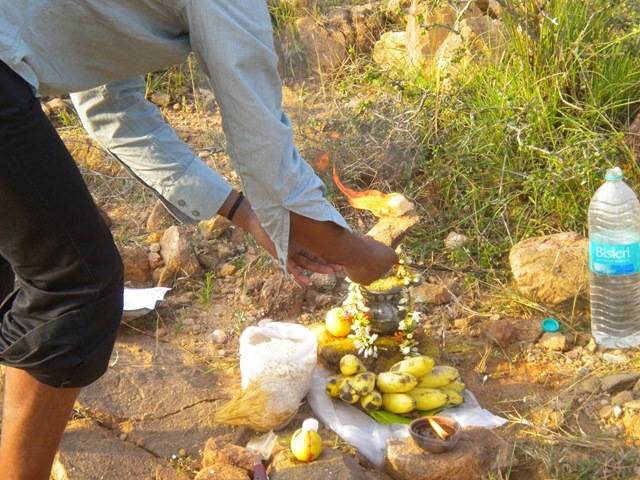 Then the incense is offered to the lingam. 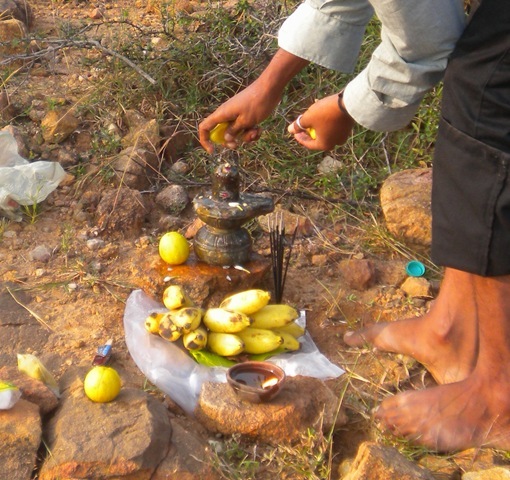 The incense is finally placed near the lingam. 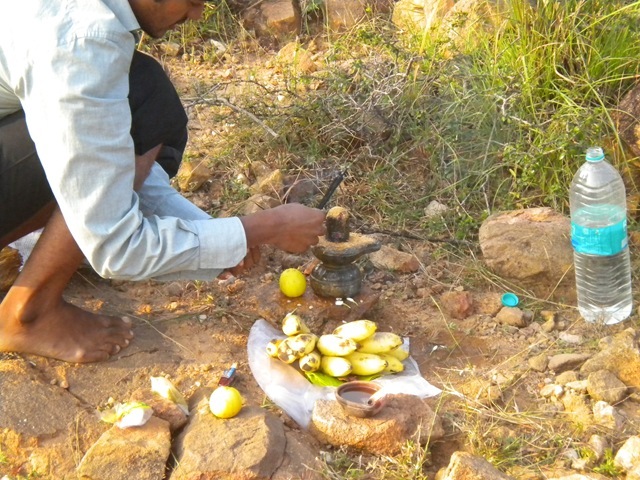 Next, lemon juice is squeezed onto the lingam. 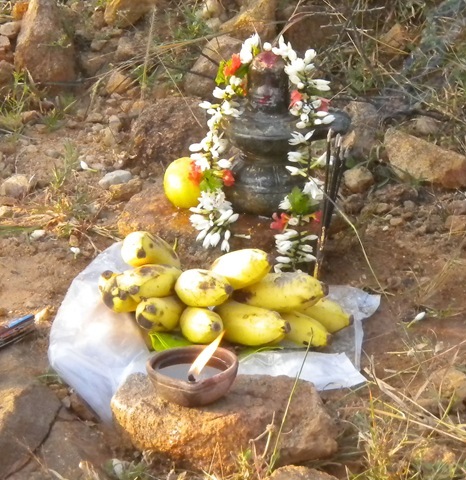 Here is the outdoor altar for the puja with what has been done so far. 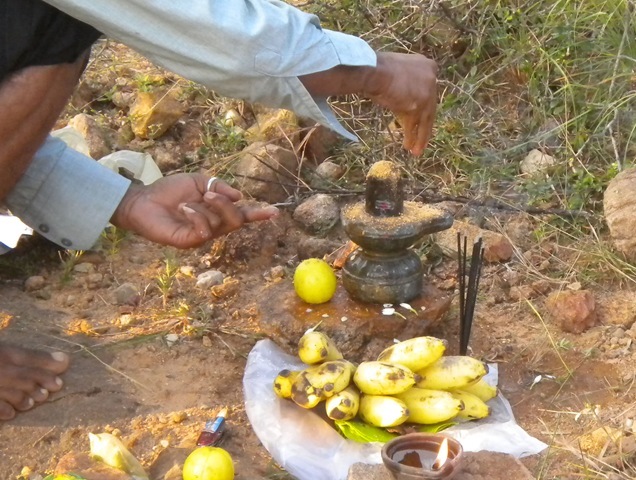 Sandalwood powder is dropped onto the lingam. Then another bath washes the sandalwood powder off. 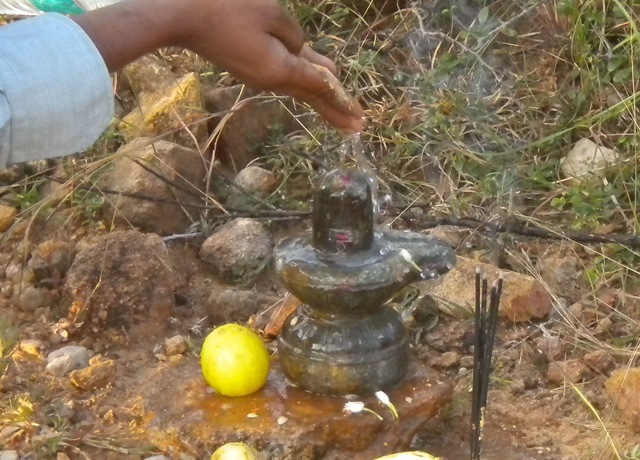 Vibhuti is rubbed onto the lingam. Then kum kum dots are added. What a beautifully decorated lingam! 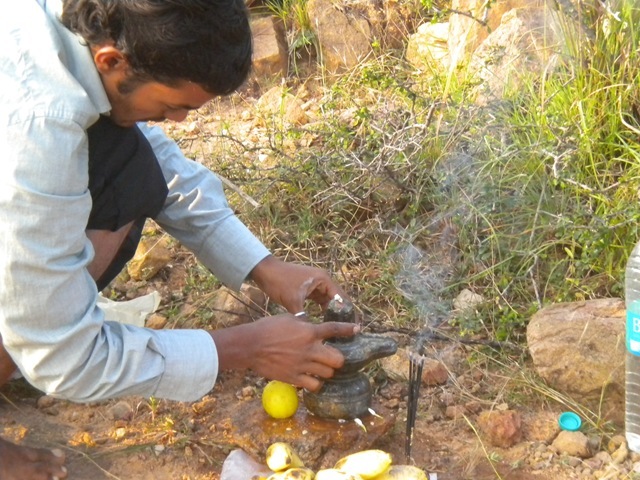 Camphor is put into one lemon, then turmeric power is dropped onto the lingam. Before we can go further, the names of the gods and siddhas must be invoked. Saran chants, and Mani follows, with a chant of 108 names of gods and siddhas. They include Siva, Hanuman, and Sri Ramana Maharshi. The gods and siddhas are asked to protect those who walk this path. 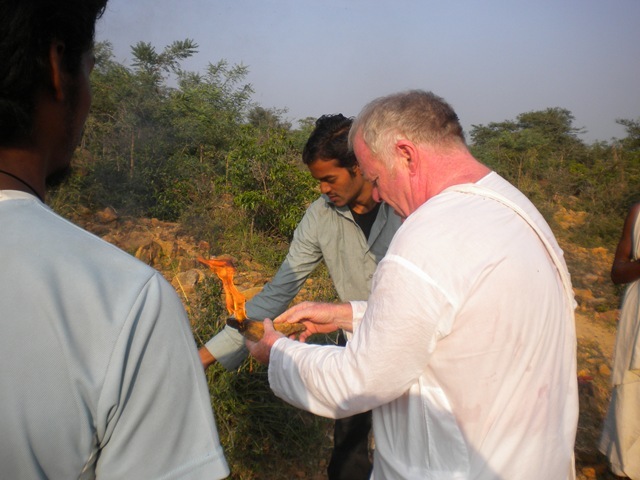 A camphor flame is lit, offered to the lingam. We each get to offer the flame. Here am I with it. 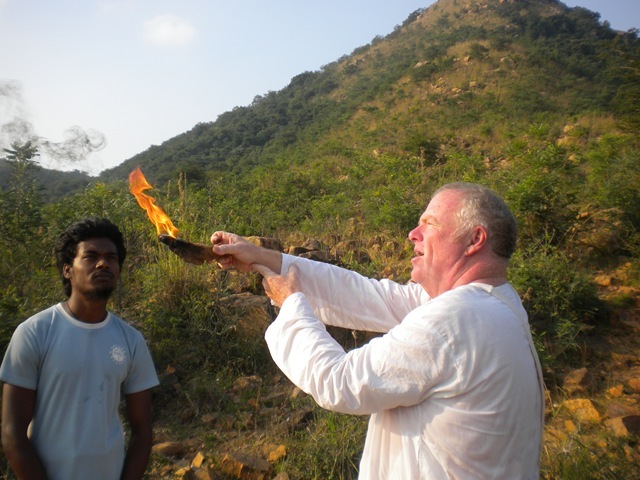 Offering the flame to Arunachala. 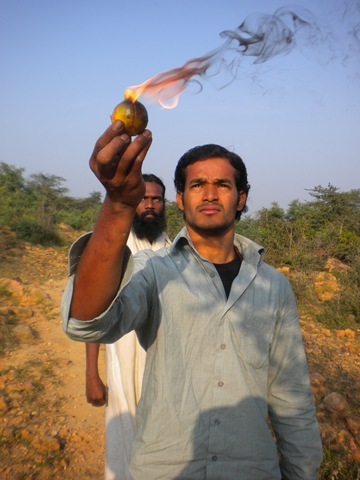 Then Saran lights the camphor placed in the lemon. 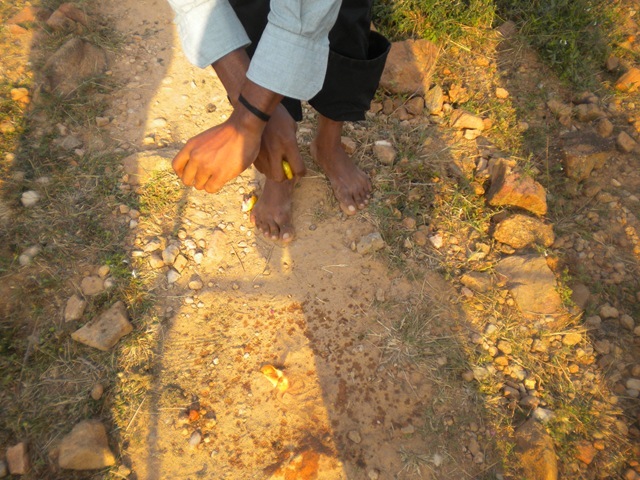 He places the camphor on the path, and squeezes lemon juice onto the path. 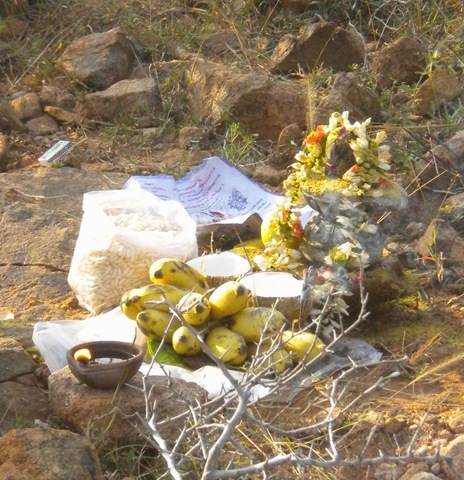 A coconut is broken, and added to the altar. There is also puffed rice, which will be given to every one attending the puja, even Tigger. We are now ready for the ribbon cutting. And now the Inner Inner Path is open! The next post will show the first walk along the newly opened Inner Inner Path. 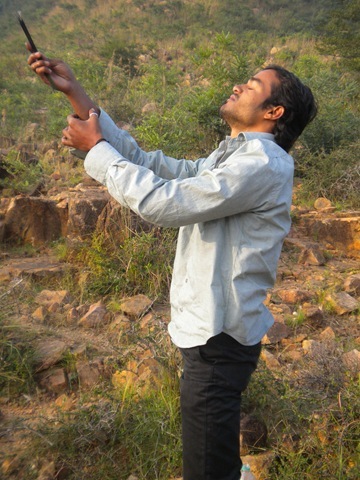 This entry was posted on February 3, 2010 at 7:03 pm and is filed under Arunachala, Spirituality, Tamil Nadu. You can follow any responses to this entry through the RSS 2.0 feed. You can leave a response, or trackback from your own site. 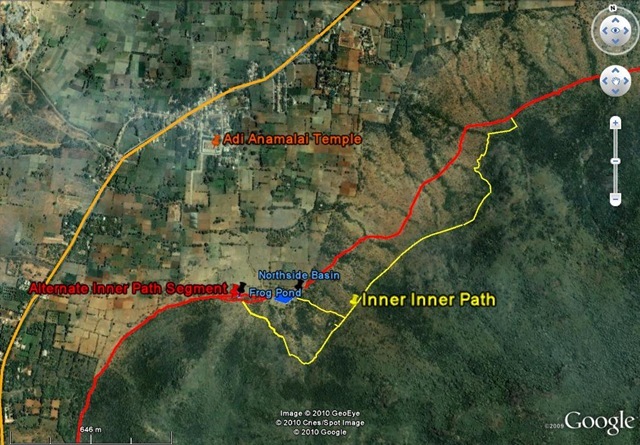 thanks to Bhagawan Ramana, we did inner path 1st time on 1st jan 2011 (0600am to 1200pm) After Ramanashram few yards I took a right turn near Municipal Buildings to follow the inner path and End at Iddukki Pillayar Temple. Near Pond I have not noticed the new inner inner path, next visit i will try. Many thanks to you & your website. thank you, mr richardclarke, for your instant reply. last week I undertook girivalam. i never knew this by that time.But skandasramam, opening being restricted then do we to coincide with that timings.And while completing inner inner path are we to again reach at skandasramam only. Thank you. The gate at the read of Ramanasramam opens at 6 am. You do not go all the way to Skandashram, but turn left after a short distance. There is a sign at the place, so it is easy to see if you are looking for it. I think it is painted on a rock to the left of the path. Most people follow the Inner Path to Pachaiamann Koil, then through the town after that, some go on back s treets, some follow the main road. very great news. how to identify the starting location of when i go next time for girivalam.what was your experience of the inner inner path.please share. Often the starting location is Sri Ramanasramam. 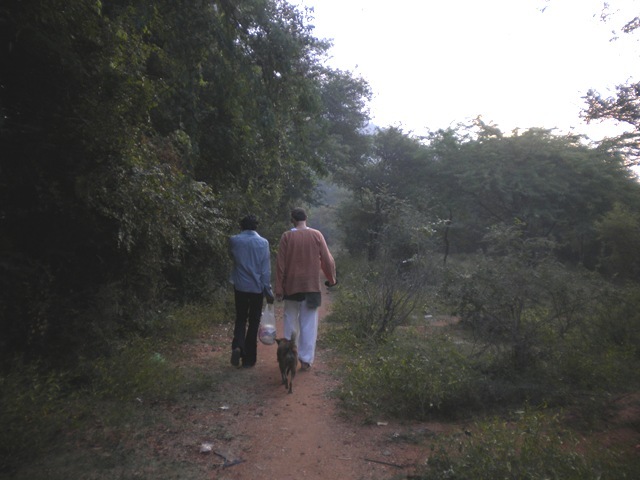 Go through the ashram, out the gate in back, and up the hilll towards Skandashram. The start on the Inner Path goes to the left after about 100 meters of this path. As to the Inner Inner Path, watch for tellow and white path markers, instead of the red and white. These show where to get onto the Inner Inner Path. Juat before my recent visit to Tiruvannamalai , I received information about the Inner – Inner path ( from your blog) from one of my well wishers . 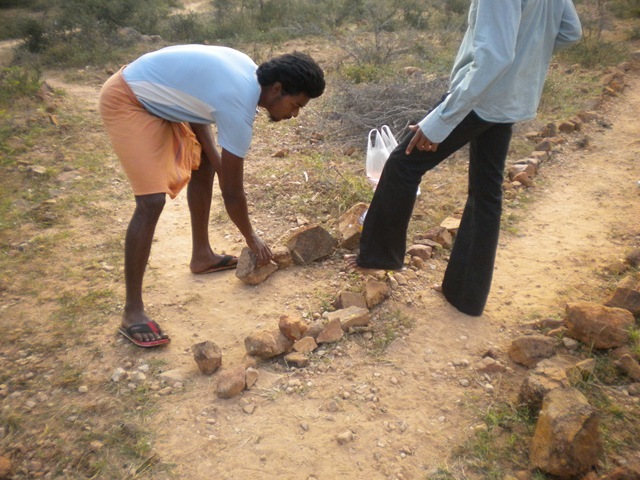 On feb 13 th, myself and two of my colleagues did the ” Girivalam” using the Inner – Inner path. It was well marked with yellow paint marking. Our experience was fantastic. 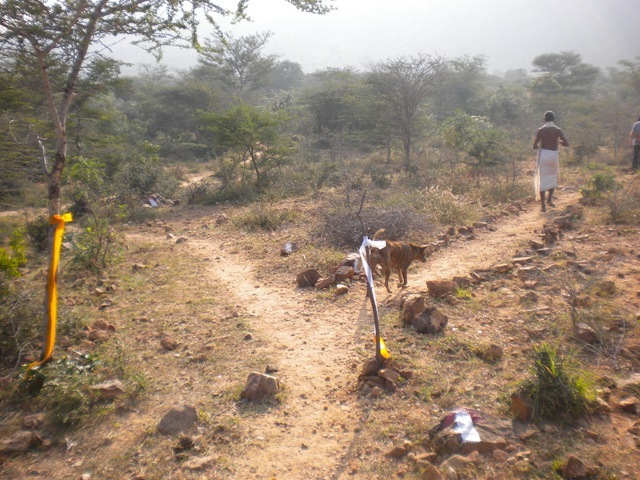 This path took us closer to the Arunachala hill . The greenery and the excellent view from close quarters are amazing. Thanks again for showing us this new path . May the Grace of Lord Arunachala be showered on you and guide you for many more similar services. 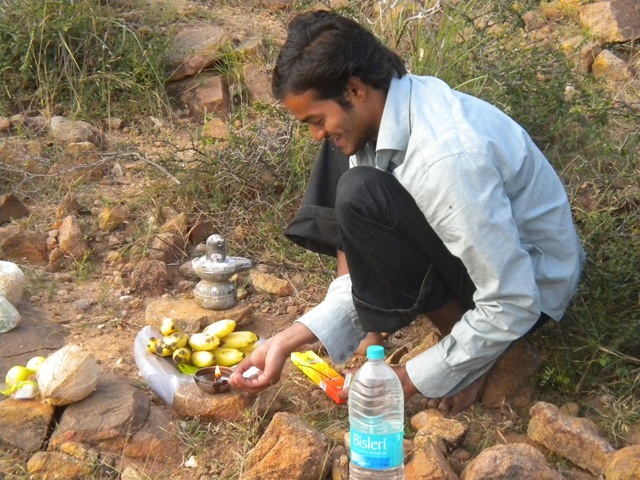 Felt very happy participating in the puja. And now, look forward to the journey along the inner path. Congratulations on your efforts and the “Inner Inner Path” ! 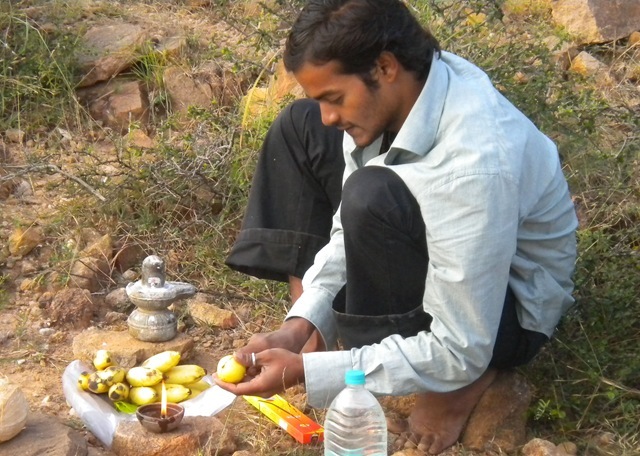 Last month, we did a Giri pradakshina in the “Inner Path”; I am sure your path will be spiritually more exciting ! Looking forward to explore your path one of these days. suprised to See your Exploration. Eagerly Waiting to see your Next blog. 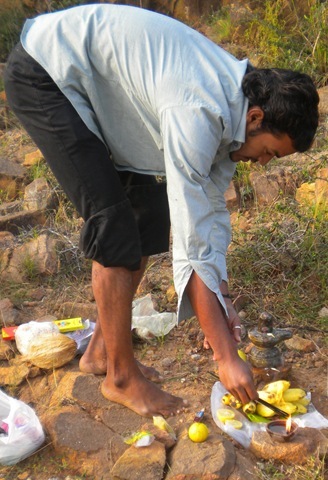 It was all Arunachala’s doing, none of mine.